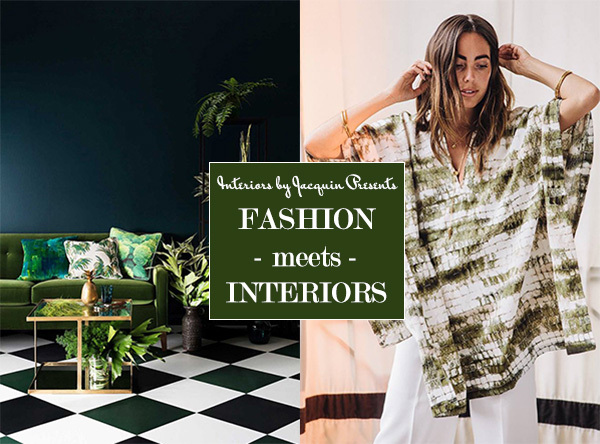 Today I’ve collaborated with luxury fashion brand Recreo and its founder Michael Coleman to bring you a new edition of Fashion meets Interiors. In this series I feature designers, stylists, and fashion bloggers who style an outfit based on their interpretation of an inspirational interior design image. Today I’m pleased to introduce luxury fashion brand Recreo. Recreo is based in San Miguel, Mexico and they are known for their high-end outerwear and traditionally inspired ponchos. 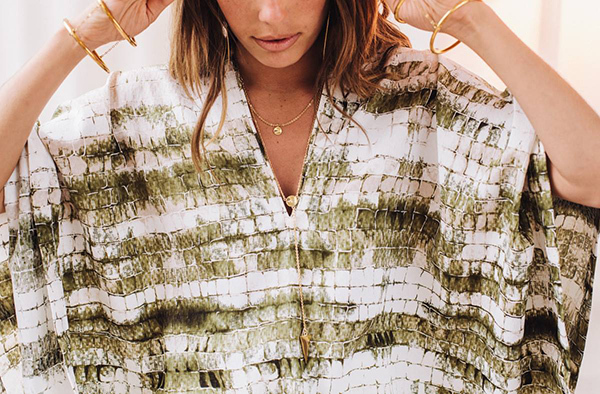 Recreo San Miguel has built an amazing following by re creating traditional garments (hence, the name “Recreo”) by updating items like the poncho, using luxurious fabrics and fashion-foward styling. Recreo’s unique “take” on outerwear has captured the admiration of the fashion press, having been featured in Vogue, W, Elle, the New York Times, Esquire, and even Architectural Digest, because their flagship store in San Miguel is so beautiful. I am pleased to present Recreo’s interpretation of this bold and tropical interior design. Michael Coleman and the Recreo team have worked together to style a chic outfit for their model inspired by this dramatic interior design. Their interpretation of this unique space is below. I hope you’ll find it as inspiring as I do. 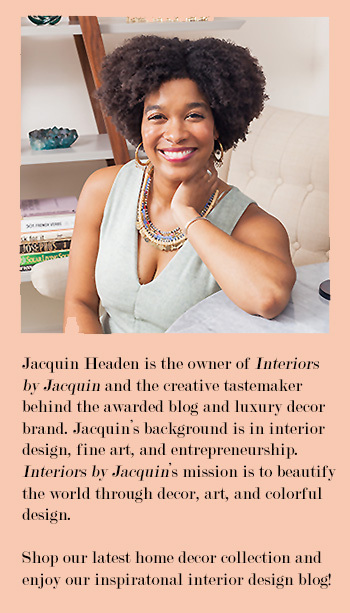 First of all, I’d like to thank Jacquin for inviting Recreo to interpret this interior design with stunning tropical refuge. We were immediately drawn to the room’s high-contrast and dramatic mix of intense, cool colors offset by punches of white and gold. 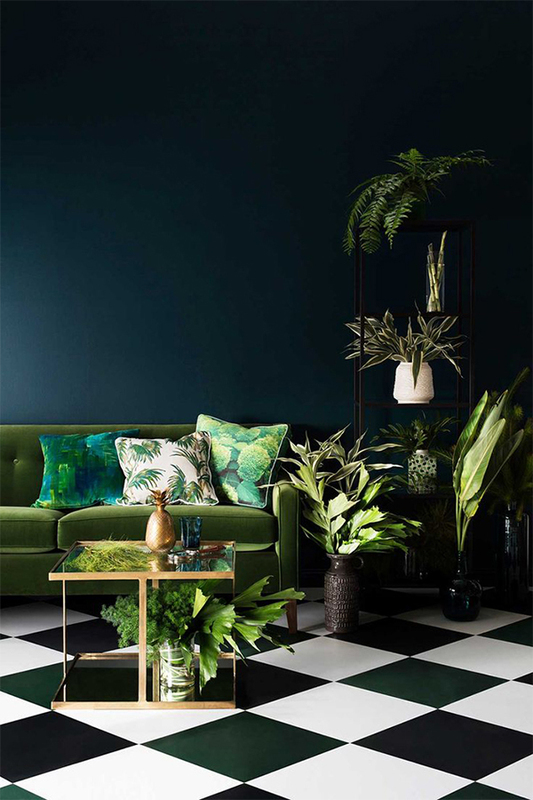 The room combines formal elements like the traditional diamond patterned tile and classical composition, combined with more informal and lush tropical influences, coming from the casually-placed potted plants and fern-patterned accent pieces. The rich shades of green in this room really inspired our design. All of this led our team to put together an outfit that echoes many of these themes, creating an outfit that embodies the spirit of the room. To anchor our outfit, we (unsurprisingly) chose a poncho from our own 2016 Recreo San Miguel collection. 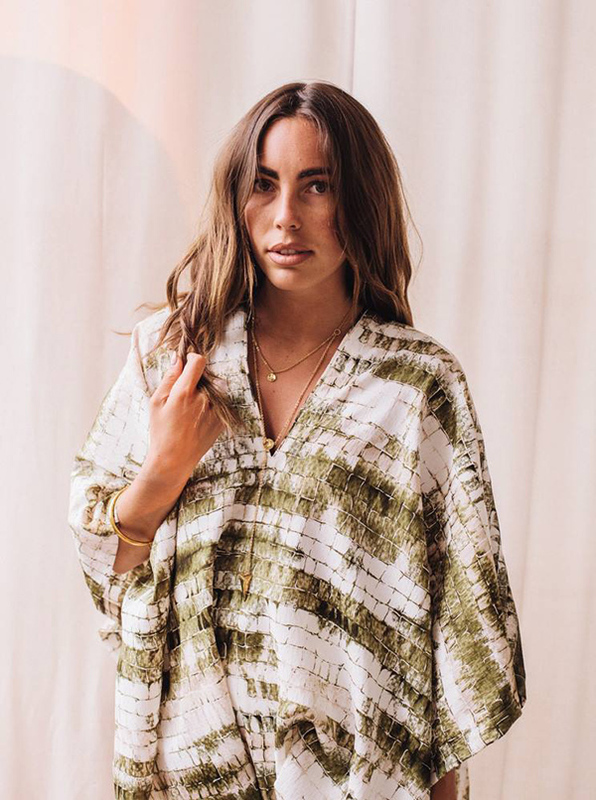 Handcrafted from a luxurious silk crêpe de chine, this poncho is flattering and flowing…just right for Spring through Summer and into the early days of Autumn. Like all Recreos, it features the beautiful brand logo in genuine sterling silver as a mark of authenticity. The garment, like the room that inspired it, features a contrast of dark greens and whites with a geometric pattern that is both structured and organic at the same time. This is a versatile piece that can be worn with or without a top; it can be paired with jeans, pants, or a mid-length skirt, so it’s perfect for today’s mix-and-match approach to dressing. And stylistically, it can go from uptown to downtown, from beach to cocktail party, to the theater. 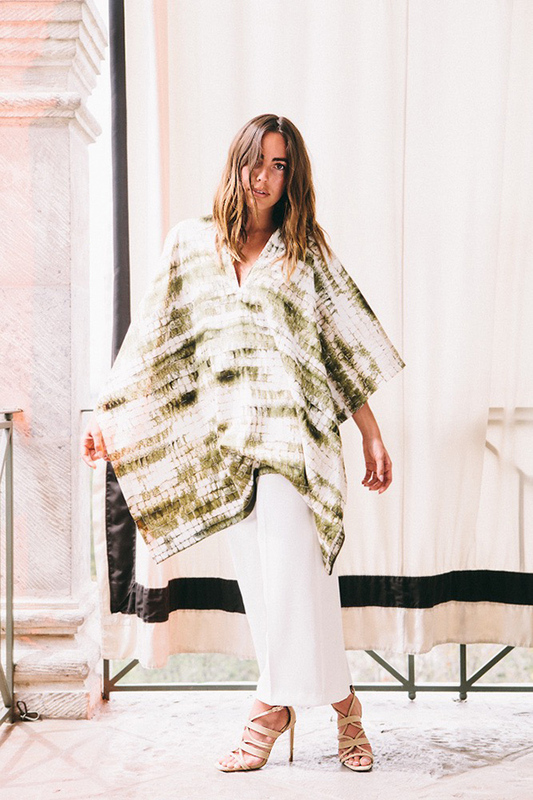 To complement the Recreo poncho, our designer Julia Sloan selected a classic white culotte from Zara that combines perfectly with the poncho; both are loose, flowing, easy-to-wear and easy-to-pair. We love these kinds of pants – culottes, gauchos, palazzo pants and similar loose cropped trousers – they’re perfect to wear on a date, for a weekend brunch with friends, or even to work. The Zara wraparound high-heel sandals we selected are – like all the other pieces – both casual and elegant at the same time, allowing for flexible styling while combined with the dramatic heel height. Rounding out our outfit, we again turned to the dynamic interior design for inspiration, which showcases pops of gold. We selected wonderful gold-washed jewelry from the Armour collection, which features jewellery that is fresh, modern, and flattering. When you put all the pieces together, you’ve got a pulled-together, cohesive look that we think you will look great in! Each Recreo garment is artisanally made in small batches, so supplies of each garment are extremely limited, making each Recreo garment special and highly coveted. 1. Silk Crepe Chine Miguel Poncho from Recreo – Recreo offers several beautiful, high-quality ponchos in a range of colors and patterns. All of us at Recreo San Miguel are delighted to share our thoughts on “inspired dressing” with you today and we hope you’ll check out our blog and website at www.RecreoSanMiguel.com. Please sign up for the Recreo newsletter on our website to stay up to date with our latest designs and collections.